Sometimes I receive very interesting e-mails or insightful comments like this: Have you found a solution to duplicate title tags/duplicate meta description issue?. I try to respond as extensive as possible at that moment, and often even dedicate posts to describe it in more detail. So today's post in dedicated to Blogger generated "Duplicate title tags/Duplicate meta descriptions" warnings in Google Webmaster Tools. I know how bad duplicate title tags and duplicate meta descriptions are, just give me "fix it" paragraph fast. What is "Duplicate title tags" or "Duplicate meta descriptions"? Search engines nowadays are smart. Very smart. However they are still what they are - machines. Sometimes they can't decide which exactly your page matches the search query the best - so they check everything that can give them more clue - titles of your pages, their meta keywords, meta descriptions - everything. However, if two your pages have the same title and same meta description, there is no such clue. That's the reason search engines consider duplicate meta descriptions/title tags as "bad", and can actually penalize you for that. What is Google Webmaster Tools and how is it related to Duplicate title tags and Duplicate meta descriptions warning? We all know Google Webmaster Tools. It is a great tool that gives you some insight on how your website is seen by Google (and can also give you some hints about up-to-date Page Rank of your pages (while toolbar rank is updated once in a couple of months, data in Google Webmaster Tools is more fresh, see "Crawl stats"). These numbers can indeed be scary. How bad is it for SEO? For every comment you have in your blog, Google thinks there exists another page with the same title tag and meta description, thus Google might decide your site is not search-engine-friendly. (Since it's actually one page, these "multiple" pages in Google's eyes will also have the same content, which can lead to duplicate content issue as well). Google Webmaster Tools doesn't show you any statistics about your pages that are considered 'duplicate content', however numbers of 'duplicate title tag issues' and 'duplicate meta description issues' might ring a bell and give you the general idea. Ok, duplicate title tags/duplicate meta descriptions are really bad. How to fix it? Basically, all we need to do to fix duplicate title tags and duplicate meta descriptions issue in Blogger is to hide links to comments in your posts from search engines. Content of the comments will still be in search engines because it is a part of your post page. Note: there is a small twist though: Google will still be able to dig some links to your comment pages from your comments feed (usually located at /feeds/comments/default). (the link that says August 22, 2008 5:46 PM). However, we would still like to be able to link to the comment if needed, so the link should still be there for users. Save the template and check how it looks. It should look the same as original, however now timestamps should link to comments by their anchor ID's, without confusing Google crawler with ?showcomment= part. (In case multi-page comments are required, the long form will be used). The described trick works in all browsers that I know of. After following instructions supplied here, Google Webmaster Tools will not bother you with the duplicate title tags/meta descriptions issue as there will be none (it takes time for Google to re-crawl all your site, so be patient, takes about 2-3 weeks). This will boost your search engine rankings a little bit since Google now thinks your site is "Google friendly" (and in fact it is). In the next post I'll describe how to teach Blogger to highlight your own comments with different color/style, so make sure you subscribe to my rss feed. Talk to a professional seo agency specialist for your website seo needs. I'm terribly sorry. It seems I felt into the same pit with autoformatting as described here. what about just using rel=nofollow? Alain-Christian, rel="nofollow" attribute only gives Google a tip that it shouldn't pass PageRank from your page to the page you are linking to, however it doesn't restrict Google from learning the url you are linking to and crawling it later. Thank you a lot! Since I changed my template, yesterday, I had 4 and today 8 duplicated content. I don't know a lot of html and I was going nuts. Hopefully I found you when I was searching for help. I hope that everything is ok now! rel="nofollow" tag will not work for our "duplicate title tags/meta descriptions" issue - as stated in this comment. You can find information on them on Wikipedia page and Official Google Blog on Nofollow. In short: they were introduced to obliterate comment spam and protect webmasters from linking to black-hat sites from it's comment areas. ...Let's put this to bed once and for all, folks: There's no such thing as a "duplicate content penalty." At least, not in the way most people mean when they say that. i don't mean to offend you, i'm just confused.. and by reading that, i sure have scrapped other's content, my other's blog! in the same blogger account that i have ,which i have deleted that blog before reposted it in my current blog. My mistake, i don't read the title clearly, it sure a different issue, my deepest apology for screwing it..
Great great article but I am a little confused. I have on my blog a special archive widget instead of a regular one. It has the exact titles of all my posts because it fatches them from rss feeds. Can you tell me if this widgets is ok, or makes it bad for search engines regarding duplicate content? Your widget is ok from 'duplicate title tags/meta descriptions' point of view. Hi, I can’t find the codes above on my template. As I am using the old blogger template. Are these instructions only applicable to the new blogger format? Is there a resolution based on the older blogger template? Thanks in advance. Yes, these instructions are for new blogger template format. I am not sure if you guys have found the solution for duplicate description problem. Any if not visit my blog http://www.makemoneyonlinewithalan.blogspot.com, I have post a simple solution to counter the duplication problem. Hope this will help. Thanks useful post. I have linked to it. Thumbs up! Hello i cant find the code. i use new blogger. but difriend template maby for that?any help? I have 63 posts in my blogspot blog but only 26 url are submitted & 10 are indexed for atom.xml sitemap.Duplicate meta descriptions are 20. Pls help,whether to go ahead with this trick ??? I'm glad it worked for you, even though with some modifications. Thanks for this useful information.I've got some dup. meta description errors in my site, im sure now i can get rid of them. Hi cranked, thanks for your tips. But I can't find the HTML code for first tips. Would you help me to pind it? I use original blogger template with few modification for sidebars. Thank you very much. Thanks for great tip. We made the above said changes for our client http://www.ufo-blogger.com and amazingly with in 20 days, they got ranked No.1 for one very interesting keyword ..
Great for tip...Thank you so much Craked..!!! Great for tip...Thank you so much Cranked..!!! i also have a problem in Duplicate meta descriptions & Duplicate title tags. myblogname/search/label/ should be restricted by robots.txt to save you from duplicate content issues. It is supposed to be this way. thanks it's what i need...but i think with wordpress,,,everything is fixed, with seo plugin..
Hello admin. Thanks for dazzling post. I need to ask that either a blogger should be do follow or no follow. I've made a blog but I've made it do follow. Is there anything troubling if I had made it dofollow. 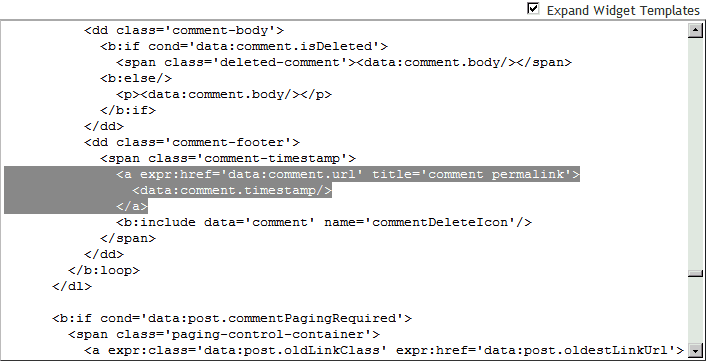 If you dofollow spammy comments, Google may threat your blog as a spamlog itself. hi cranked i have made what you said in this post two days ago but i can see that the new posts still having the title of the homepage :( shall i wait or what to do ? This article focuses on issues other than post titles. Thus, doing everything described in this article will not magically change titles of your post pages. You probably want this article: How to optimize your Blogger post page titles for search engines moving the blog name to the end of the title. ok cranked done but i have a question now every post i made "the older posts" that's archieved in google will it change also or will stay with the home page title ? and if it's gonna change how much time will it take ? My blog have 196 pages with duplicate title, can it fix using above method too? Why this think happen...I still don't understand. I never duplicate any other blog post.... please help.. Duplicate content issue is only huge on Blogspot. Wow!!! what an awesome point here. I found sort of errors that make my crawling stats suffer, “duplicate title and descriptions tags”. 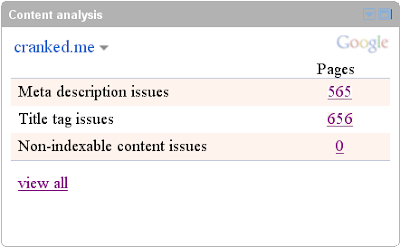 Looking for some reason in the net and evaluate the structure of my blog template I found these possible causes. Thanks for sharing this post so much. Thanks for this useful information. I applied these tags in my HTML 2 weeks ago but nothing has changed since on webmaster tools. I have got 40 duplicate meta descriptions and right now it is 40. Can you tell me what should I do exactly or Should I wait two weeks more to see the results?